The Nokia Lumia 1020 is a mind-boggling smartphone that just arrived in our office and as it’s making the rounds ahead of our first in-depth look (stay tuned! ), we have to clarify a few things about its most important feature - the camera. The Lumia 1020 comes with a 41-megapixel camera and at first look - judging by the pixel count - one would think that this means the size of the sensor (the part of the camera that collects light) is the same as the one in the 41-megapixel Nokia 808 PureView. Turns out, that is not exactly true. The Nokia Lumia 1020 actually has a very large by smartphone standards but still smaller sensor than the one in the 808 PureView. While the one on the 808 measures 1/1.2” in size, the 1020 has a 1/1.5” sensor. What this means is that you have less space and smaller pixels. Without the oversampling, the physical size of pixels on the Lumia 1020 is 1.12µm compared to the larger 1.34µm on the 808. 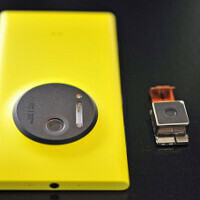 Lumia 1020 has a sensor (2/3) that is much larger than that of a traditional smartphone (1/3.2). We have gotten a bit technical here, so let us explain what this means. Pixels are like buckets, but instead of collecting water, they collect light. The bigger the pixel the more light it collects and the more light it collects the better the images at night time and other situations where light is scarce. At first sight, that means the Lumia 1020 has a slight disadvantage when fared against its older sibling, the 808 PureView. Let’s not jump into conclusions that quickly, though. The new Nokia Lumia 1020 has some key advantages that come with that smaller sensor. The most obvious is the physical size of the device, it’s much slimmer than the chubby 808 PureView. Next, the small size made it possible for Nokia to include optical image stabilization (OIS) that allows for longer exposure times and ultimately better video and low light shots. Finally, this is not the same sensor as on the 808 PureView. Despite its larger sized, the 808 used front-side illumination, a more primitive camera technology where wires connecting the camera pixels with the phone got in the way of light and stopped some of it. The Lumia 1020 has a modern backside-illuminated (BSI) sensor with those wires not getting in the way, and allowing for the full lightstream to hit the pixels. 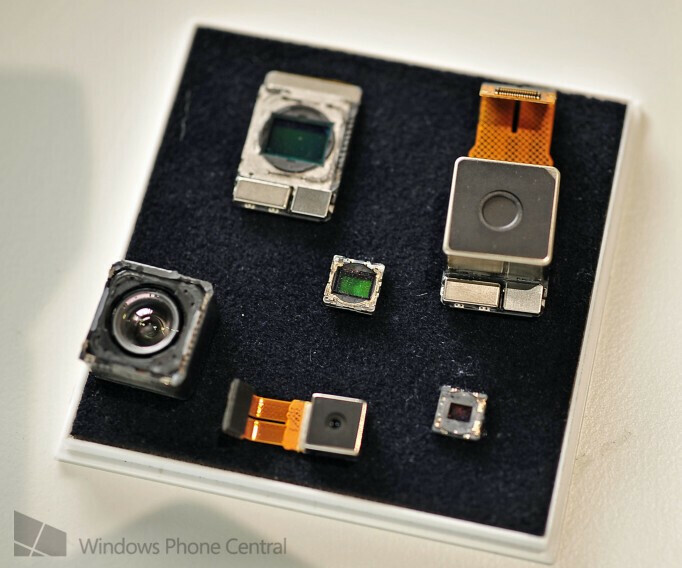 Lumia 1020 camera sensor (top right) dwarfs traditional smartphone cameras. In reality, this means that despite the smaller sensor size, Nokia has made some key improvements that should yield similar if not sharper and better images on new Lumia 1020. In conclusion, we’d like to also mention the lossless zoom capabilities of the new Nokia camera superphone. The Lumia 1020 has a zoom range of 25-69mm in SLR terms for image still and 25-100mm for 1080p video. Its f/2.2 aperture however does not drop when you go into higher zoom levels. That is one huge advantage as even the most complex DSLR lenses close the aperture and require much longer exposure times. The Lumia 1020 does not suffer from those mechanical problems. How big of a revolution the Lumia 1020 is in smartphone photography? Stay tuned as our first in-depth look of the device is coming soon. Won't be surprised if the Nokia bested the Honami. I wouldn't be surprised if the Sony Honami and Lumia 1020 bested the Galaxy S4 Zoom. I would like to say that, in my opinion, I think one of the reasons Sony hasn't announced the Honami device yet was because they were waiting to hear about the Lumia 1020. There was originally suppose to be an event on July 4th but that never happened. I'm guessing they postponed it possibly because they felt the need to update the device in light of the Lumia 1020. This is all speculation, but I think it's possible. the rumored honami sensor is also 2/3 so don't expect it to outclass the 1020. as much as i like sony, they can't seem to perfect their own technology. their xperia z camera does not even compare to those used by other flagships even if they're the ones supplying the sensor. i just hope sony changes for the better. There is another reason why Honami can be better than Lumia 1020. The rumours also said Honami will have, Handheld Twilight Mode, Xenon/LED Flash, Super SteadyShot Image Stabilization. just remember Honami camera is developed by Sony Electronics Imaging division not by Sony Mobile. To cover the same area for the photo, Lumia uses two pixels where Honami has one. Also, the optical image stabilizer should help to beat Honami in Video quality and fixed/slow moving objects in low light condition. Regarding pixel size: Not sure if I calculated it wrong, or if the figure in the article is incorrect or if there are any other factors I didn't take into account. Assuming x/y ratio 1.5:1 and 1/1.5", I get a sensor of 14x9.4mm² for Lumia, which gives 3.2mu^2 area per pixel (pixel widh: approx. 1.8mu) Assuming x/y ratio 1.5:1 and 1/2.3", I get a sensor of 9.2x6.13mm² for Honami, which gives 2.8mu^2 area per pixel (pixel width: approx. 1.7mu) Full disclosure: I'm Nokia SW engineer, so I might be biased, but if my calculations are wrong, it's an honest mistake. After reading some more of the comments, I think I know why I get other figures for Honami: I read in different sources that the Honami would have a 1/2.3" sensor (engadget, heise.de), while most people here seem to expect a 2/3" sensor. Is there a reliable source of information for this? stop whining about honami. it's not even pre unit yet and you keep whining. wait until release and they will go head to head. They grumble. Fingers crossed for Nokia, easily. I thought everyone did the same to lumia 1020 when it was still Nokia EOS? I urge you to wait for the Honami, Note III with OIS, Motorola with rumored Nikon camera and the G2. With the 1020 you'd gain an excellent camera, but give up so much on the HW and battery front that mid-day when syncing and shooting killed your battery, you wished you never changed. Lossless zoom is not a marketing gimmick. Just look at the 808. The issue here is that wp is such a garbage os that it can't handle original 808's tech, and no matter how much Nokia tries to make us believe otherwise, that is the simple fact. Look at the grain on these images compared to the 808. You have to hunt for grain on the full res 808 pics, and on the over-sampled ones, grain is absent. The 1020 is nothing more than a bad 808 knock off. I own a 920, but I am not a blind fanboy. The 1020 is mediocre. I hope phonearena compares the 808 and 1020 to illustrate the pawnage the 808 dishes out. The 1020's shots literally look like wp's garbage, cartoony algorithms on better hardware. In essence, a polished turd. So boosook, the tech isn't garbage, and the 808 proves that. What is garbage here is wp8's software. Wp8 can't handle an ND filter and it can't handle two dedicated scaling chips, so right off the bat there is no way this can measure up to the 808. Everyone knows the adreno 220 can't handle the 808's tech, but yet nokia have crammed it in. Well, behold the results in the form of noise, chromatic aberration, over saturation and detail smearing from noise suppressing algorithms, all problems that the 808 does not have. If this were a linux based os, if ms were faster with their updates, if wp8 wasn't so restricted, the results might have been magical. One look at the 808's Flikr page and you know right off the bat that the 1020 is nothing but a toy. It doesn't even have HDR or the options to adjust saturation, contrast, sharpness, frame rate(30,25,15 fps), resolutions (2,3,5,8 megapixels and 360p). I am disappointed in Nokia to the point where I feel like selling my 920 and getting a HTC one at this point. Looking at the full-res images I notice quite a large amount of denoising followed by aggressive sharpening, full-res doesn't look quite as good as on the 808. Now if you take a 4X zoomed image, it'll be a 2,5MP cutoff of the 41MP full frame, noisy and not very satisfying. Per pixel the Exmor RS is a better sensor, wouldn't mind them going 808 with it, which BTW is a better PureView than the 1020. When it comes to zooming, it's still best to have optical capabilities, which means you capture everything at full sensor size. Agree, i noticed that too. Last night i was checking it out from my phone and it looked super, until i tried it on the PC today, zoomed in and saw specs of white particles all over, particularly on night shots. However, the amount of light captured in the night shot is good. Colour representation, exposure and the rest is great. Well, nobody knows if those images were manipulated or not. But it's really HARD for me to believe that those weren't retouched. Metering is good, Color representation is good, but the question is...Are those images really came straight out of cam? The Color temperature seems to lean on the warmer side, kinda reminds of the Sigma (a lens Maker) Color warmth. We're only gonna find out when user samples are up for comparison, but it's not Nokia's intentions to release fake samples with a lot of noise and loss of color details (the faces on the group photo in Central Park are particularly troubled by it). It's probably the lens that doesn't let through as much sharp detail as the one on the larger 808, the 32MP (16:9) samples weigh in around 8 megabytes which is around the file size of a detailed Galaxy S4 shot at 13 megapixels, which means during daylight the Exmor RS comes close capturing as much detail at much lower resolution. The RS could've wiped the floor with the PureView but they couldn't get the RGBW processing ready in time, hence the average to bad low-light performance. Hope the Honami has the RGBW version. keep whining....sony's the best blabla..I didn't see their best in a direct comparison any sony's handset with exmor or rs vs n8 or 808. Magic? How very intelligent of you haha. replying to yourself? another paranoic? you have must hit hard in the head saying such a cr$%....Christ..I can understand one's love toward sony but.....this is pathetic.